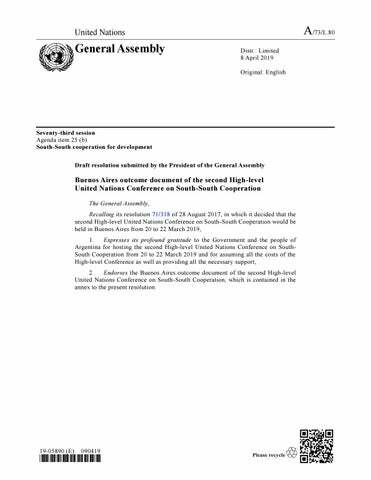 Buenos Aires outcome document of the second High-level United Nations Conference on South-South Cooperation The General Assembly, Recalling its resolution 71/318 of 28 August 2017, in which it decided that the second High-level United Nations Conference on South-South Cooperation would be held in Buenos Aires from 20 to 22 March 2019, 1. Expresses its profound gratitude to the Government and the people of Argentina for hosting the second High-level United Nations Conference on SouthSouth Cooperation from 20 to 22 March 2019 and for assuming all the costs of the High-level Conference as well as providing all the necessary support; 2. Endorses the Buenos Aires outcome document of the second High-level United Nations Conference on South-South Cooperation, which is contained in the annex to the present resolution. countriesâ&#x20AC;&#x2122; capacities to eradicate poverty, reduce inequality and produce more high value goods and services. 32. We recognize trends towards rapid urbanization in developing countries and call for greater South-South and triangular cooperation initiatives aimed at eradication of poverty in all its forms and dimensions in urban and rural areas through more coordinated policies and sharing of knowledge, solutions and experience, by raising the productivity, resilience and sustainability at the local level, including of urban centers where 68 per cent of the worldâ&#x20AC;&#x2122;s population is projected to live by 2050. An important means to this end is sharing of good practices in participatory urban planning and management. We stress the importance of scaling up South -South and triangular cooperation towards decent work for all, local community development and service delivery in rural areas to address the drivers of rural -to-urban migration and related challenges. 33. We recognize the need to mobilize adequate resources from all sources, including public, private, domestic and international, for enhancing South -South and triangular cooperation and, in this context, we commend developing countr ies that have partnered with United Nations entities and established financing facilities and trust funds to advance South-South cooperation for addressing development challenges. We commend developed countries for their support, to South -South cooperation and engagement in triangular cooperation and encourage them to further scale it up. 34. We welcome contributions to the PĂŠrez-Guerrero Trust Fund for South-South Cooperation and the United Nations Fund for South-South Cooperation and invite all developed and developing countries to keep up and scale up their efforts in this regard. In this context, we encourage UNOSSC to support these efforts by undertaking resource mobilization initiatives to facilitate the effective and efficient use of financial and in-kind resources for the United Nations Fund for South-South Cooperation, in line with the overall UNDP resource mobilization strategy and strategic plans while avoiding fragmentation of financing arrangements. We also encourage UNOSSC and relevant United Nations entities, upon request, to facilitate developing countries to access South-South cooperation funds. 35. We welcome the progress made since Monterrey Consensus on Financing for Development to develop and mobilize support for innovative sources and mechanisms of additional financing, and we encourage countries to further explore new sources and instruments of innovative financing for funding the Sustainable Development Goals at the global, regional, national and subnational levels, as appropriate. 36. We call upon the Secretary General to report, on the implementation of this outcome document, in his existing reports to the General Assembly and the High Level Committee on South-South Cooperation, as appropriate. 37. We convey our appreciation and gratitude to the Republic of Argentina and its people for the excellent organization and hosting of the Second United Nations High level Conference on South-South Cooperation and the warm hospitality extended to us in the city of Buenos Aires.